Philippe Aubin : Surf Riding in the Caribbean, 1756.
commanded by captain Philippe Aubin, on the coast of Dutch Guyana in south America in 1756.
commandé par le capitaine Philippe Aubin, sur la côte de la Guyane hollandaise, dans l'Amérique méridionale en 1756. Chez Née de la Rochelle, A Paris, 1788-89. Volume 3, pages 256 - 301. This unique report of surfboard riding in the Caribbean from the mid-18th century, was identified and contributed by Hervé Manificat in November 2014, with sincere thanks. Note that several sources incorrectly state that he was born in 1750. Philippe Aubin appears to be of French ancestry, from a Protestant family who relocated to England following Louis XIV's revocation of the Edict of Nantes, effectively declaring Protestantism illegal, in October 1685. His father, David Aubin, was a captain in the English navy who died in Panama fighting the Spanish at the Battle of Porto Bello in 1738. Philippe's brother also entered the English Navy, on the staff of Admiral Durell, rising to the rank of second lieutenant. He died in 1745, aged twenty-seven, from wounds received at the siege of Louisbourg, the then French capital of Île-Royale, present-day Cape Breton Island, Nova Scotia. Following the family tradition, Aubin signed on as merchant mariner, and by 1747, at the age of 17, he was sailing on trading vessels around the Caribbean islands and off the coasts of the Americas. Odile Gannier (1996) noted that when Europeans entered the Caribbean they were astonished by the dug-out log canoes and the extraordinary skills in navigation, adopting the terms canoe and pirogue from the indigenous languages. The larger pirogue was hollowed from a long log, and paddled by a large crew, moved incredibly fast. The natives were excellent navigators, with a thorough knowledge of the islands and a remarkable system for taking bearings, and they adapted techniques for fishing, preserving food and transporting it. 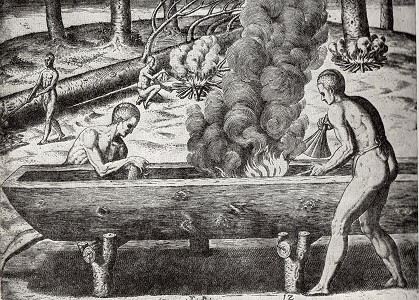 Right: Making a log canoe in Virginia, on the coast of North America. Theodor de Bry: Collectiones peregrinatorium in Indiam, Frankfurt, 1590. - Rudolph, Wolfgang: Boats, Rafts, Ships. Adlard Coles Limited, London, 1974, Plate 13, page 26. Rising to captain, Philippe Aubin sailed the Caribbean from 1750 until he was shipwrecked in late 1756. The Betsey, under Aubin's command, was commissioned to deliver provisions and horses for Dutch traders from Carlisle Bay, Barbados, to Suniman on the coast of South America, and sank on August 5, 1756. Arriving at Man-O-War Bay, Tobago, Aubin was restored to health by the local Caribs, and then sailed to Europe for medical treatment. He later returned to the Caribbean and in September 1776 he sailed to Newburyport, Massachusetts, apparently to support of the American revolutionaries in the War of Independence. Whatever the reason, the outbreak of war had severely disrupted the prospects of merchant trade in the Caribbean. Aubin then settled in Massachusetts and submitted the tale of his shipwreck to the Journal Anglois, published by chez Ruault, Paris, appearing in Number 18 on 30 June 1776. Following the success of Daniel Defoe's Robinson Crusoe (1719), accounts of shipwrecked castaways were popular with readers, and publishers, in Europe up to the early 19th century. The original, as yet unseen, was possibly prepared for publication with the assistance of a professional writer. While the original French edition was written in the first person, the English versions are often transcribed to the third person. The Records and History of the Marine Society of Newburyport record that Captain Philip Aubin was admitted as a member on November 29, 1781, page 29. In 1787 he travelled to France, possibly to encourage support for the revolution, and in January 1788 he was at Reims, east of Paris, where he was interviewed by Jean Desperthes, then preparing for the publication of the third volume of Histoire des naufrages in 1789. Aubin "confirmed all the circumstances told in his account of his misadventure" to Desperthes, who then added the account of surf riding and the footnote, "Cook found the same game in the inhabitants of Othaïti (Tahiti) and the neighbouring islands." Although several versions of have been published in English and French, listed below, Hervé notes "this is the only one with the surf scene." The account of surf riding is apparently at Man-O-War Bay, on the north-west tip of Tobago, among "the happiest people I have ever saw in 33 years I spent by the sea,"
wannasurf.com records three breaks on the island with five images of waves of substantial size. Aubin also observed surf riding on the Turks islands, now Turks and Caicos islands, located in the south-east Bahamas and north of Haïti. For the Turks and Caicos islands, wannasurf.com records one break with two images of waves of reasonable size. 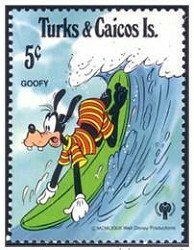 Right: Turks and Caicos Islands Postage Stamp, 1979. Series: International Year of the Child. Around 1788, Philippe married Abigail Greenleaf, whose family had connections to William Coombs, President of the Marine Society of Newburyport and an enthusiastic supporter of privateering as a means to advance the American Revolution. Abigail gave birth to Philip, Jr.in 1779, followed by John born in 1781, Lydia in 1783, Joshua in 1789, and the last, Greenleaf, born in 1795. After the war, the family occupied 4 Orange Street, Newburyport, built by Aubin in 1783. Philip Jr. was lost a son at sea in 1799 and John died in Martinique in 1810. "the shallop Betsy, Joseph Aubin, master, arrived from Gaberaris Island, Cape Breton, after six weeks' passage. She had on board household furniture, dried fish and oil, which were designed for the use of himself and his family, having come here with the intention of becoming a citizen of the United States. His shallop of 30 tons was hauled up until a representation could be made to the secretary or Congress regarding his intentions," page 489. While he continued with his maritime career, Aubin also diversified his interests and in 1794 he was one of the incorporates of the Newburyport Woolen Manufacturing Company, one of the earliest textile mills in the area. Philippe Aubin died at sea on 25 August 1801, aged 71, in the the vicinity of the French-held Guadaloupe and not far from the island of Tobago, where his life had been saved 25 years earlier. Following Philippe's death, the Marine Society of Newburyport made provision for Abigail Aubin; on 31 January, 1805, the committee elected to "defray the expenses of repairing the damage done Mrs. Aubin by the blowing down of her chimney" (page 98), and an annual provision of widows' benefits was continued at least until 1831, and possibly up to her death in 1839. L'Homme, [Paris], Volume 36, Issue 138, 1996, pages 25-63. A note on the translation. While Aubin's use of "foot" to indicate width may seem unusual in 2014, in this era pre-dates the introduction of the metric system. Although certain standards, such as the pied du roi (the king's foot) had a degree of pre-eminence and were used by savants across Europe, many traders chose to use their own measuring devices, giving scope for fraud and hindering commerce and industry. The pied du roi probably approximated the Imperial (English) foot of 12 inches, or 30 centimetres. The Wreck of the Betsey - editions. Journal Anglois, chez Ruault, Paris, Number 18, 30 June, 1776. Naufragia, or, Historical memoirs of shipwrecks and of the providential deliverance of vessels. London, 1806, Volume 2, page 21. IX. Shipwreck of the Sloop Betsey, captain P. Aubin, on the coast of Dutch Guiana, in South America, 1756, from the account by Captain Aubin, inserted in the Journal Anglois, (No. 18) 30 Juin, 1776, Paris, chez Ruault. The Betsey sailed from Carlisle Bay, Barbadoes, on the 1st of August; she was a Bermudian sloop, built of Cedar, laden with Provisions; and had been freighted by M. M. Rosto and Nyles. Some remarks on the Caribs are subjoined, with a short account of Captain Aubin, and a description of the Antilles"
Aubin, Philippe: Shipwreck of the sloop Betsey, commanded by captain Philippe Aubin, on the coast of Dutch Guyana in south America in 1756. Histoire des naufrages, ou Recueil des relations ... v.3. Aubin, Phillip: The Shipwreck of the Sloop Betsy. Philip Aubin, Commander, On the Coast of Dutch Guiana, the 5th of August, 1756. The Mariner's Chronicle: being a collection of ...: narratives of shipwrecks, fires, famines . J. Cundee, 1804 vol. 1 pages 106-121. Aubin, Phillip: Loss of the Betsey. in [Clarke]: Chronicles of the sea: or, Faithful narratives of shipwrecks, fires, famines. William Mark Clarke, London, 1838-1840, Volume 1, pages 457-462. The Island Caribs are almost amphibians, they spend much of their lives in the sea. They passionately love shellfish, and in order to collect the biggest ones, they pick them sometimes six or seven fathoms deep in water, especially to catch the fish that the French Creoles call "cambies". They dive, and bring up one in each hand, and throw them in their canoe. There is no sea, so big and so stormy that can scare them and prevents them from diving when they want. They make the reach the rocky point, and thus rise by degrees from rock to rock in the surf; when they are found to have water to the waist level, they present themselves sideways to the wave to split it more easily, and still go on to move forward. If the sea is too strong for them to stand on their legs, and if they fear that the flow will drive them to the shore, they cling with both hands to the point of a rock, and let their feet and body to the flow of the wave, and let it pass them : immediately after, they appear on the water surface. that they no longer have to worry that the resulting wave will throw them against the rocks. The habit of swimming, diving and avoiding the force of the wave is formed early by those people. Children aged twelve and fourteen have a unique game that would frighten a European. They choose a plain beach with no rocks; there, they will move together, each one having a plank in his hand, as wide as they can find, then they put their chest on the board ; then they abandon themselves to the wave. Others have a square board, about a foot wide, with a hole at each end through which they hold it. Then they advance as far as they like into the sea, all arranged in a row, and let themselves ride on the summit of the swells toward the beach: the wave is sometimes so high that for those spectators who look at them from the shore, their heads appear like black balls on a carpet of snow. I saw children having fun at the same exercise at the Bay of Bermuda, the Turks islands near Santo Domingo, where I made several trips to load salt for the fishing in North America (*). (*) Footnote: Captain Cook found the same game in the inhabitants of Othaïti (Tahiti) and the neighbouring islands. Captain Philippe Aubin (**) was twenty-six years old when shipwrecked. Since the age of seventeen he was in command in of the sloops or trading vessels trading among the islands of the coast of Arique. In January 1778 he was in Reims, and he confirmed all circumstances reported in the account of his misfortune. Readers may find of interest the following details which he forwarded as regards the Caribbean, the island of Tobago, and its benevolent hosts..
Footnote (**) His father, David Aubin, was an English Navy Captain who died in an expedition against Puerto Belo, America. Philippe Aubin's brother also entered the English Navy, on the staff of Admiral Durell, rising to the rank of second lieutenant. He died in 1745, aged twenty-seven, from wounds he received at the siege of Louisbourg. These details were sent by Captain Aubin by post, 3 September 1778, in response to some elucidations we had requested. Les Caraïbes sont presque amphibies, ils passent une grande partie de leur vie dans la mer. Ils aiment passionnément le coquillage, et pour en pêcher de la plus grosse espèce, ils vont les chercher quelquefois à six ou sept brasses au fond de l'eau, surtout pour pêcher les poissons que les Créoles français appellent cambies. Ils plongent, et en rapportent un dans chaque main, et les jettent dans leur canot. Il n'est point de mer, si grosse et si orageuse qu'elle soit qui les effraie et qui les empêche de plonger lorsqu'ils en ont envie. Ils gagnent la pointe des rochers, et s'élèvent ainsi par degrés de rochers en rochers, dans la lame ; dès qu'ils se trouvent avoir de l'eau jusqu'à la ceinture, ils présentent le flanc à la lame pour la fendre plus aisément, et continuent d'avancer toujours. Si la mer est trop forte pour qu'ils puissent se tenir sur leurs jambes, et qu'ils craignent que le flot ne les entraîne vers le rivage, ils se cramponnent avec les deux mains à la pointe d'un rocher, et abandonnent en arrière leurs pieds et leurs corps à la vague, ils la laissent passer sur eux : aussitôt après on les voit reparaître sur l'eau. n'aient plus à craindre que la vague en les entraînant ne les jette contre les rochers. L'habitude de nager, de plonger et de tromper les coups de la lame, se forme de bonne heure chez eux. Les enfants de douze à quatorze ans se font un amusement singulier, qui ferait trembler un Européen. Ils choisissent une grève unie et sans rochers ; là, ils vont plusieurs ensemble, ayant chacun dans la main une petite planche aussi large qu'ils la peuvent trouver, et se mettent la poitrine dessus ; ensuite ils s'abandonnent à la vague ; d'autre ont une planche carrée, d'environ un pied, avec un trou aux deux bouts par lesquels ils la tiennent. Alors ils avancent aussi loin qu'il leur plait dans la mer, tous rangés à la file, et se laissent entraîner sur la cime des flots vers le rivage : la lame est quelquefois si haute, qu'aux yeux de ceux qui les voient du rivage, leurs têtes semblent autant de boules noires sur un tapis de neige. J'ai vu les enfants s'amuser au même exercice à la baie des Bermudes, dans les isles des Turcs près de Saint-Domingue, où j'ai fait plusieurs voyages pour charger du sel pour la pêche du nord de l'Amérique (*). (*) Footnote : Le capitaine Cook a retrouvé ce même jeu chez les habitants d'Othaïti (Tahiti) et des îles voisines. Le capitaine Philippe Aubin (**) avoit vingt-six ans lors de son naufrage. Depuis l'âge de dix-sept ans, il commandoit en chef des sloops ou vaisseaux de commerce pour les îles & côtes de l'Arique. En 1778 , il étoit au mois de Janvier à Reims, & il confirma toutes les circonstances rapportées dans la relation de son infortune. ajouté une légére description des Antilles dont cette île fait partie; il ne doit point être indifférent aux lecteurs de la trouver ici. ( ** ) David Aubin , son père, capitaine de la marine Angloise , mourut encore jeune, des fuites d'une expédition contre Porto-Bílo , en Amérique. Philippe Aubin resta orphelin avec un frère. Ce dernier entra aussi dans la marine Angloise, & s'attacha à l'amiral Durell. II mourut en 1745 , à l'âge de vingt-sept ans, des blessures qu'il avoit reçues au siege de Louisbourg. II étoit second lieutenant de vaisseau. Ce détail nous a été envoyé le 3 Septembre 1778, par le capitaine Aubin luimême , à la fuite de quelques éclaircissemens que nous lui avions demandés. Geoff Cater and Hervé Manificat (2014) : Philip Aubin : Surf Riding in the Caribbean, 1756.